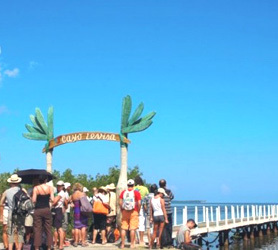 The Yayabo Bridge (Puente Yayabo), which rises up over the city of Sancti Spíritus, is the only one of its type in Cuba and one of the most ancient in the country. It was built from bricks, lime and sand from the surrounding area, without using cement, according to one technical report from the laboratory of the National Centre of Conservation, Restoration and Museums. Maribí Cabrera, an engineer from the Centre of Patrimony in this Cuban province, in declarations to Prensa Latina commented that the study, carried out with different samples, contradicted the theory of the use of cement brought all the way from Italy, which supposedly influenced the strength of the building, now a National Monument, that is still standing today. Cabrera and Anai Gómez, two specialists that requested the investigation, said that the confusion came from the use of the term “roman cement", which was used during this period to refer to a mixture of lime, sand and puzzolana (volcanic rocks, bricks, tiles or other ceramic materials) which were pulverised by mechanical means, for use as a construction material. Another fact which confirms this theory is that cement was patented in 1844, much later than the final construction of the bridge between the two shores. The specialists have explained that its resistance is due to the use of local materials and not imported ones from Europe. The Capitulary Acts (Actas Capitulares) and other documents of the colonial period which were examined, contain even yet another surprise, the construction of the Yayabo bridge was carried out by prisoners of the area and not by slaves, as had originally been thought.